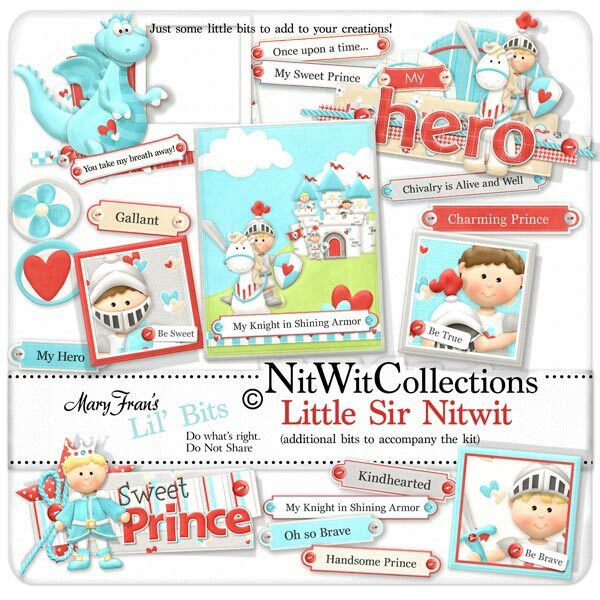 "Little Sir Nitwit" Lil' Bits is a great element pack that has been off in the town shop and had many items completed to help you easily create your inspired journey. You would be considered a noble craftsman to use these! Elements in the Lil' Bits are NOT included in the "Little Sir Nitwit" FQB. 1 Dragon with frame - "You take my Breath Away"
1 Wordart - "My Knight in Shining Armor"
1 Wordart - "My Hero"
1 Wordart - "Sweet Prince"